The Community Ladies Luncheons are held at the Country Club on the third Wednesday of each month September through May. They are open to ALL residents of the OPCC and Loch Rane communities and their guests. Check in time is 11:30 and lunch is served at noon. The cost is under $15.00 and can be paid by cash, check redit or club card. This is a great way to meet your neighbors. If you are new to the neighborhood, please come. We would all love to meet you! This is a great group of ladies who take turns planning the menus with Chef Mike and finding interesting speakers or entertainment. We always have raffles and typically collect food to donate to the Food Pantry. The luncheons are always listed in our neighborhood newsletter and in the online calendar. 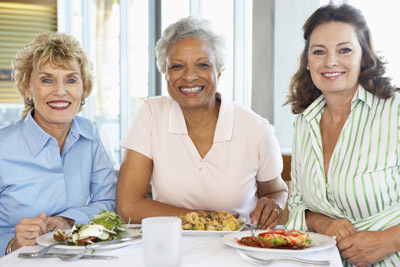 If you would like to be added to the Contact List for the Community Ladies Luncheons so that you can be notified about the luncheons in advance by email please contact nancy Zambie (904) 264-4079 or nzambie@comcast.net.